While I wait for my hard copies of Canal House Cooking I-II-III,( couldn’t wait and downloaded 1 for kindle). I found a recipe or two to try from volume 1, perfect for a blustery stay in kinda day. With such an easy dinner to prepare I found a little time to read more about the authors and their approach to cooking which certainly is “doable”. I look forward to trying several of the recipes…so easy. Winter tomatoes leave much to be desired, but readily available Campari and vine ripe tomatoes should work perfectly for this dish, I won’t be using those wonderful and pricey “heirloom” tomatoes in this recipe. I have a large can of salted anchovies as well as the anchovies packed in olive oil so I already know that I’ll be making this dish more than once to taste the flavor difference between both anchovies. Today I’ll make just enough for 2, use canned anchovies, and add a touch of grated parmesan before roasting the tomatoes. I have my own seasoned fresh bread crumbs that will add additional flavor over the tomatoes that I have already prepared a couple of hours ahead of time. I’m thinking that my small tomatoes won’t take long to bake, certainly not an hour so I’ll have to keep an eye on them to be sure they don’t collapse. Have ready a big pot of water to cook 1/2 lb Dreamfield’s spaghetti. 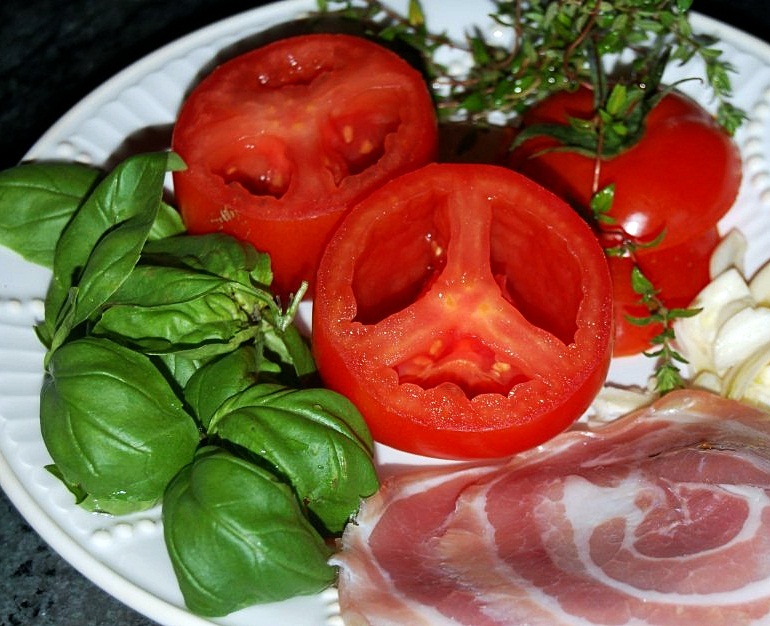 Heat a sauté pan and add a bit of EVOO, cook pancetta until crispy and sit on an absorbent paper towel. Add 2 tablespoons EVOO and anchovies, stirring to break down the anchovies, add fresh bread crumbs, and stir crumbs until golden remove to small dish. 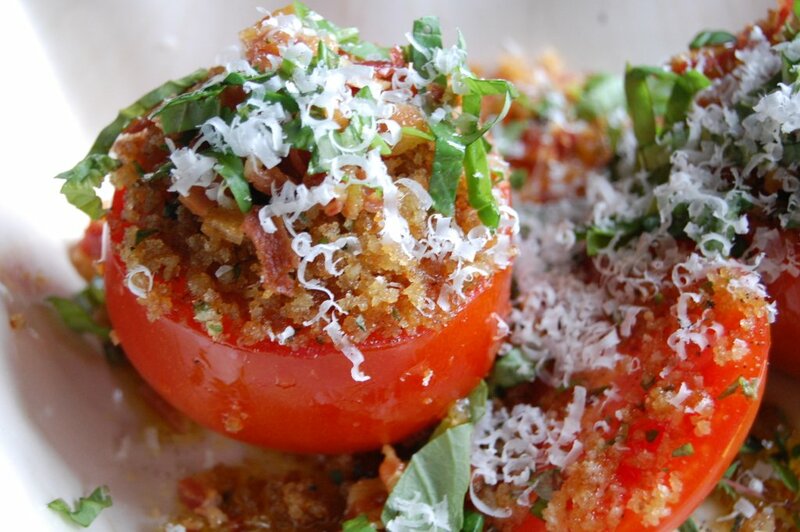 Put a tiny bit of EVOO in a baking dish large enough to accommodate tomatoes, tuck garlic into the tomatoes, season with salt and pepper and a pinch of ground red pepper flakes, and mound the tomatoes with crumbs making sure to get some into the wells with garlic. Scatter herbs on top. Drizzle 2 tablespoons of olive oil over all. Roast the tomatoes in the oven until they have browned a bit and the interior is supple but the tomatoes have not collapsed, about one hour. Cook the spaghetti in a large pot of boiling salted water. Drain, but reserve 1/2 cup of the pasta water. Return the pasta to the pot and remove the tomatoes from the baking dish and set aside. 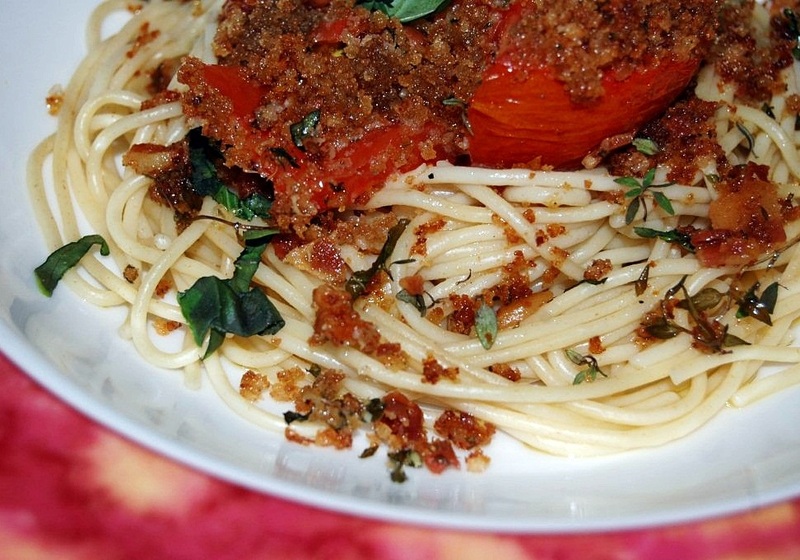 Stir the oily tomato juices and any bits of bread crumbs from the bottom of the tomato roasting dish into the pasta. Add a little olive oil and the reserved pasta water and toss. Pour the pasta into a serving bowl, place the tomatoes on top, sprinkle the pancetta over all and serve. I love a little crushed red pepper and more cheese please, but not necessary.